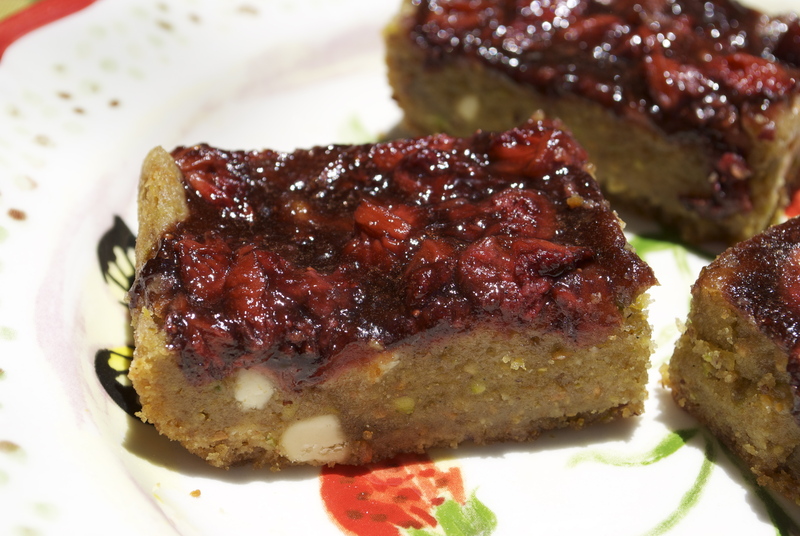 White Chocolate Pistachio Cookie Bars w/ Strawberry-Balsamic Topping. It’s obvious by now. I could spend the rest of my days creating vegan versions of Eat the Love recipes. It’s like….my favorite. My absolute favorite. I know this may seem strange, but I know I have a similar palate to certain omnivores. It’s strange, because they eat so much differently than I do. I just know that Irvin’s combinations really strike a chord in me. Not only do they inspire me, but some of my vegan versions of his treats are the most delicious things I’ve ever eaten. My own recipe creations are always and ever evolving and really hope to be as inspired and creative as Irvin is someday. I feel the same way about Geoffrey Zakarian and less so about Giada, but many of her recipes translate into some damn fine veganese cuisine. But on to the recipe. These were originally blondies on Irvin’s site, but the vegan version most definitely translates more to a cookie bar than a blondie…meaning, instead of being chewy, or slightly cakey or of general brownie/blondie texture, this is more of a cookie dough that you take and bake into a huge delicious square instead of round flat circles. Give it a try and let me know what you think. 3 tsp balsamic vinegar, divded. Preheat oven to 350°F. Lightly grease an 8×8 or 9×9 square pan. Line with parchment paper. Place the Earth Balance, olive oil, and sugars in the bowl of a standing mixer, fitted with a paddle attachment. Cream together until light and fluffy and the color of cinnamon sugar. Add the egg replacer, scraping down the sides of the bowl between additions. Add vanilla extract. Add the salt and beat to incorporate. Add the flour and pistachio meal, mix to incorporate. The dough may seem just a bit dry, that is okay. Press firmly into your pan. Make the topping by adding all ingredients except 1 tsp of balsamic to a saucepan. Cook over medium heat until the strawberries start to release their juices and the mixtures thickens slightly. Remove from heat and then stir in your reserved 1 tsp of balsamic. Use a rubber spatula to spread this topping over the cookie bars. Do not try to swirl it in, the cookie bars will be more of a dough than a batter, so swirling is not really possible here. Bake for 30 to 40 minutes. Let bars cool before slicing them. ← M&M Peach Ranch + Blueberry-Cherry Red Wine Pie. I only discovered Eat the Love a few months ago and have made my own version of his strawberry balsamic brownies, love that combination! I’m impressed with how well you’re adapting everything, keep it up!